Don’t be fooled by the hype of the TV commercials. The truth is, testosterone creams and gels simply do not deliver enough hormone supplements to elevate your levels to optimal range. For that reason, the doctors at Royal Men’s Medical Center do not prescribe hormone creams or hormone gels. The goal of effective testosterone therapy is to optimize levels. 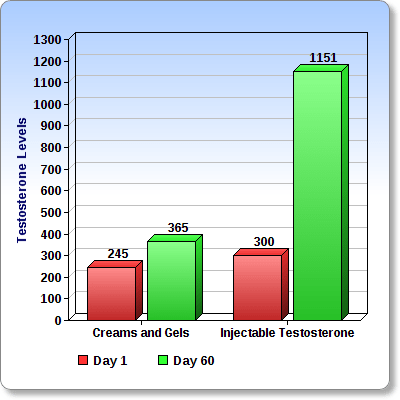 The bar graph below clearly illustrates (over a 60 day period) the vast superiority and effectiveness of the hormone injections prescribed by doctors, compared to the hormone creams and gels you see on TV. Where would you rather be on the chart? 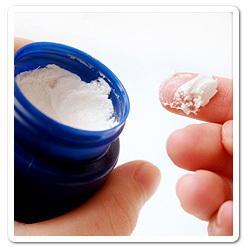 Another alarming fact is that most patients who are prescribed testosterone creams or gels do not receive the essential supporting medications. Testosterone alone causes hormonal inconsistencies when it is not accompanied by the correct supporting medications. When treating a patient with Low T, a competent physician should be testing and addressing other hormones as well. Treating a man for Low T is not just about raising his testosterone level with hormone therapy. It’s about properly balancing all hormones that contribute to a patient’s condition. This is why the supporting medications are so important for a patient’s well-being. Royal Men’s Medical Center has a fine tuned, proven and complete therapeutic program that will optimize your testosterone level and help you feel you’re very best.